The Los Angeles Lakers is the most famous basketball team on earth. In terms of history, no other ballclub compares. Founded in 1947 as the Minneapolis Lakers, they transformed to become the “LA Lakers” starting in 1960. Since then, the team has won 16 NBA championships and has hosted such legends as Wilt Chamberlain, Elgin Baylor, Jerry West, Kareem Abdul-Jabbar, Magic Johnson, James Worthy, Shaquille O’Neal, and Kobe Bryant. From the coaching end, they’ve been led by icons Pat Riley and Phil Jackson. The Lakers are defined by one color: gold. That’s the color on their jerseys. That’s the color painted on their floor. That’s the color they often wear at the end of the NBA season: a gold medal for winning the golden NBA ring. This 2012 – 2013 season, the residents of Los Angeles — tens of thousands of whom are our Filipino relatives — could not have been more optimistic. Why? Because they have as golden a line-up as any other NBA team. If Miami Heat has the “Big Three” in LeBron James, Dwayne Wade and Chris Bosh, the LA Lakers has the “Fantastic Four” in Kobe, Pau Gasol and their two newest recruits, Steve Nash and Dwight Howard. Imagine a Bryant-Gasol-Nash-Howard team? They can play with four players and beat a squad with five men. 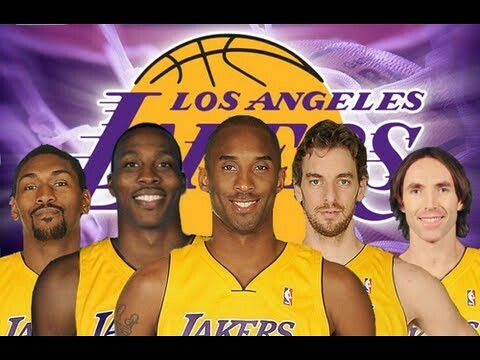 Add Metta World Peace (Ron Artest) or Antawn Jamison and you’ll have an unbeatable team. We’re looking at a 96-0 (regular season and playoff period) record! Wait, wait. Not so fast. It turns out this all-star cast won’t score a perfect-win season. Game 1 vs. the Dallas Mavericks? Lakers lost, 99-91. Game 2 vs. the Portland Trail Blazers? Lakers lost 116-106. Game 3 vs. their “neighbor,” the LA Clippers? I watched that on Channel 45 yesterday. Lakers lost again. From Hollywood-like expectations, the Lakers have become Bollywood; they’ve turned-over the ball, missed easy shots, lost Steve Nash to injury in Game 3, and are now scrambling. Yesterday, in LA v. LA, since the time that I switched on the TV set in the 2nd quarter, the Clippers led each and every minute. Gold-and-Purple was trampled by Blue-and-White. From the highest of expectations, now the Lakers are being castigated. And this is a valid concern: Not since 34 years ago has the Lakers started 0-3. In every step of yesterday’s game, the Lakers were beaten. In fast-break points, the Clippers beat them, 21-8; in second-chance points, the same scenario: 20-7. The Clippers player I enjoyed watching? Chris Paul. He scored 18 and dished-out 15 assists. He was all-smiles because Steve Nash was absent with a bruised left shin. “To be remembered from now until April: The Clippers haven’t won the season series with the Lakers since 1992-93,” wrote Mike Bresnahan of the LA Times in ‘Lakers lost to Clippers, 105-95, fall to 0-3.’ He added, “In fact, they took the series one other time in the 42-year history of their franchise, when they were the Buffalo Braves in 1974-75. Is this start a cause for concern? Absolutely. Is it time to panic and say that the Lakers can’t win this whole thing? No. Like Miami two years ago, it takes time for super heroes to work together. Let’s just hope, in tomorrow’s game vs. the Detroit Pistons, this “Fantastic Four” won’t go 0-4. Now they’ve fired their coach and are talking about bringing Phil Jackson back….. Again!